At the basin of the Kolyma River at the foothills of the Cherski mountains, one of the tribes, the Chukchi people, went on to develop the Siberian Husky. These dogs were developed to meet the requirements of their specific needs. The required specific confirmation of this dog was to provide speed and endurance over great distances, therefore kilo for kilo the Siberian Husky would be one of the strongest draft dogs. Siberian Huskies live up to 12 years of age. Siberians should be gentle, reliable and friendly. Their superb temperament makes them good family companions for people of all ages. As a breed, they are affectionate to one and all. Inherent in the characteristics of the breed is an alert, outgoing and clownish personality. The dog's desire to please, coupled with its inclination to be stubborn and strong-willed, with unrivalled independence, is perhaps a carry-over from its working heritage. Each Siberian has a nature and identity of its own. Care needs to be taken as this is a true pack animal and needs to know who is boss. If raised with other pets they are fine. Without regular exercise a Siberian will become a nuisance, doing anything to alleviate boredom. These dogs will regulate their food intake. They have a naturally slow metabolism and need exercise to simulate their appetite. There is nothing as unsightly as an obese Siberian Husky. While many breeds moult with the seasons, in the Siberian the entire undercoat of the dog comes out in clumps, much like sheep's wool. 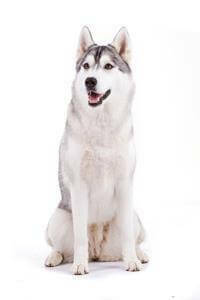 Siberian Huskies are extremely energetic and with a great desire to run. An understanding of their heritage and use should give you a good indication of their exercise requirements. Siberians do well in sledding activities, which provide a much-needed outlet for their energy. With this breed there are a few things to bear in mind; namely the potential for chasing and killing livestock, plus the breed's generally independent demeanour. These dogs don't bark a lot - but their song of joy can be noisy. The Siberian Husky is not the ideal breed for everybody, but for those who are prepared to supply the exercise and companionship this breed requires, owning a Siberian can be a richly rewarding experience. Click here for advice on adopting a rescue dog and finding a breeder. All information has been provided by the Kennel Club. ®/TM Trademarks of Mars, Incorporated and its affiliates. © Mars, Incorporated, 2017. All rights reserved. As the makers of PEDIGREE®, everything we do is for the love of dogs. From the dog food we make to the dog adoption drive we support.